I went to lunch at Portillo’s last week with my sketching friend. 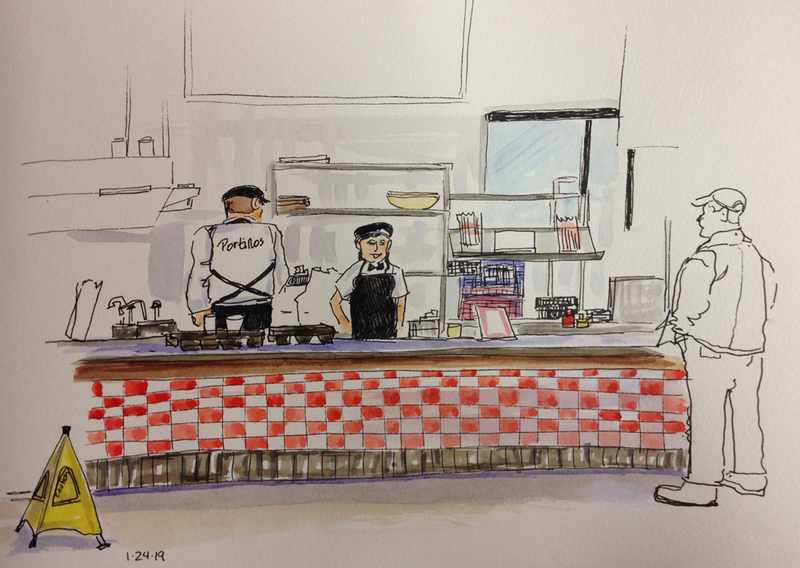 I have sketched this Chicago born hot dog/other food place before, but this time I was able to add both the workers behind the counter and a guy waiting for his food. Also a yellow floor sign so people won’t fall where it’s been mopped. A lot was going on in the background, including signs, dishes, equipment, and more shelves. But I let that all fade into the background and made the checked counter and people the focus. It’s important to let the sketch have a focus and work outward. I started with a blank page and hurriedly sketched the man in the baseball cap on the right. Then I sketched the counter, added the workers, then worked the sketch outward from there. Both the workers and the patron were waiting, and it was fun to see how each person handled the lull in time.